Where does the ARU stand on Super Rugby format changes? SANZAAR has met in London and after two days of “robust” discussion will meet for “further discussion and consultation” before “final discussion and consultation” that allows “the adoption of changes proposed by the strategic plan,” according to a brief statement from its chief executive Andy Marinos. Marinos stated, too, that there will be further information from SANZAAR sometime within the “coming days” after the national unions take the proposed changes back to their board and the broadcasters for a final agreement. The point here is that the broadcasters have the final decision. They provide the money, so they have to confirm the final outcome of what the unions agree to agree about. In the case of the ARU, this broadcast money (for Super Rugby and the Rugby Championship) over the term of the current contract that expires in 2020 is $285m. This money is the life blood of rugby in Australia. The ARU, in its current dire financial situation, needs to agree with a format that enhances its cut of the deal, even at some cost to the structure of the game here. Trying to decipher where this slippery officialese jargon from SANZAAR’s short statement is leading to, though, is as tricky as trying to eat spaghetti with a knife. But here goes. There is going to be some change to the current 18-team format. But what that change will be is still up in the air. Any change is likely to keep the Sunwolves and the Jaguares in the tournament. Why? Because the strategic thinking within SANZAAR is that the tournament, over time, has to growth further than the original three SANZAR nations – South Africa, New Zealand and Australia – to reach its financial potential. The broadcasters are on board with this growth concept because the tournament already generates large amounts of money from its re-broadcasts in Europe. The Sunwolves bring the huge Asian market (especially after the 2019 Rugby World Cup tournament is Japan) into play. The Jaguares allow for a further expansion, sometime in the future, into the Americas market where four national sides have played in Rugby World Cup tournaments. This growth notion, it needs to be remembered, runs directly counter to a format of 15 teams in three conferences in 2018 and then a Trans-Tasman tournament when the broadcasting rights are re-negotiated that the former ARU chief executive, John O’Neill, has recently proposed. The problem with this excellent O’Neill concept is that the New Zealand Rugby Union is determined, for rugby and historical reasons, to maintain as much of the New Zealand-South Africa rugby connection as it can. Moreover, there are grave fears about the future competitiveness and financial health of Australian rugby within the New Zealand rugby community. Part of the fear is a lack of respect for the rugby nous of the ARU current board, its chairman and its chief executive. 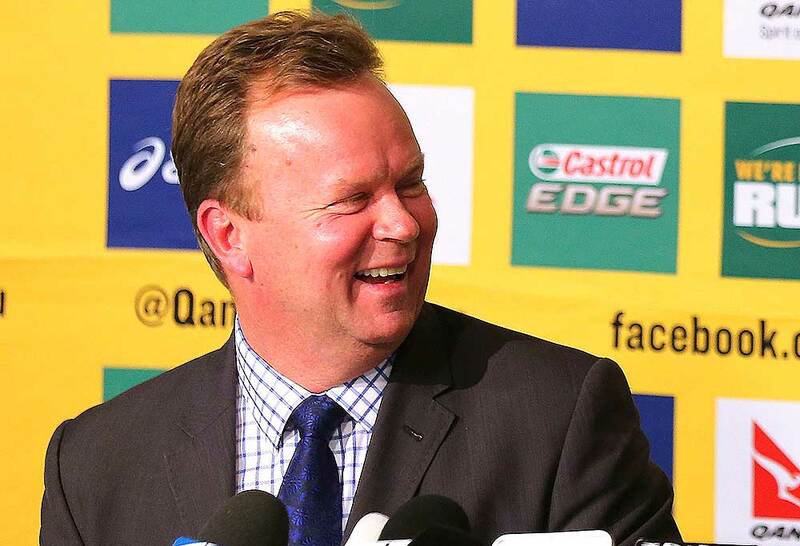 The ARU has rather heroically refused to outline its preferred position on a new format. Chief executive Bill Pulver told rugby journalists recently that the board had prepared responses to a number of different possibilities and prefers to take a wider world view, rather than a narrow Australian approach, to the matter. 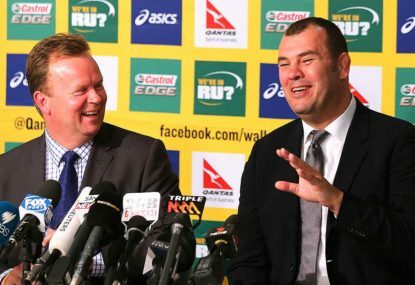 One of the aspects of the ARU’s negotiations that has puzzled people within the rugby community is the negotiations in London were conducted on the ARU’s side by Bill Pulver and board member Brett Robinson. Robinson is a former Wallaby and captain of the Brumbies, a doctor who has an additional degree from Oxford University and a businessman. These are impressive credentials. But he is not the chairman of the ARU. These negotiations require or should require the full authority of the ARU being invested in them. This means that the current chairman, Cameron Clyne, should have been leading the ARU’s team. The “international stuff” apparently doesn’t interest Clyne. He has delegated his chairman responsibilities to Robinson. Well, he should step down to make way for someone who is interested and knowledgeable about SANZAAR and World Rugby politics, someone like O’Neill. This negligence on the part of Clyne (and the need for experience and expertise in negotiation from someone like O’Neill) is all the more shameful in that the ARU has a weak hand to play in these negotiations. New Zealand Super Rugby teams playing in New Zealand apparently out-rate the Australian teams playing in Australia on Fox Sports. This is hardly surprising given the lacklustre play of the Australian teams and the often brilliant play of the New Zealand sides, with the woeful kickathon on Saturday night between the Blues and the Highlanders being an exception. Then there is the current weak performance of the Australian teams. The Brumbies lost their first two matches of the season for the first time since 1999. They were better, especially defensively, in their win over the weekend against the Force. But they (the Brumbies) are yet to defeat an overseas side. However, the Brumbies were hardly a side that looks like a championship contender. The Force were leading 17-13 going into the final ten minutes of play. But a yellow card against Force second-rower Ross Haylett-Petty gave the Brumbies the impetus to score two tries and storm to victory 25–17. The Reds managed to turn victory into defeat with a brain-dead series of hit-ups right on time and inside their own half. A Reds forward flopped over the ball to seal it off and gave away a penalty that was successfully converted by the Crusaders number 10, Mitch Hunt. The Reds got some mongrel back into their game in front of over 17,931 spectators. Good. But they conceded a 20–7 lead in the last 18 minutes of play. Not so good. Ironically, it was Samu Kerevi who gave away the crucial penalty after he had played a blinder with his busting runs and a storming try. The Waratahs have lost both their matches in South Africa. The Lions thrashed them two weeks ago 55–36 at Johannesburg. This was the first time the Waratahs have conceded over 50 points since the 96–19 thrashing handed out to them by the Crusaders in 2002. Only 14,000 viewers watched the match on Fox Sports. What irked me in watching the Waratahs going down 37–14 on Sunday night was the fact they did not play the traditional Waratahs ensemble, ball-in-hand game. In the first minute of play, Nick Phipps put in two (two!) box kicks. The first one was charged down. The second one barely went past the Waratahs 22. The Sharks snaffled the ball and after a series of phases scored the opening try. The Sharks, on the other hand, were inventive in their lineout plays, ran the ball well, counter-attacked or kicked long and generally played the muscular South African game with plenty of strong running from the backs. It was rugby that was a joy to watch, unlike the Waratahs’ rugby-by-numbers style. At half-time, the score line was 31–7 to the Sharks. But the fatigue of coming back from Australia set in. The Sharks knocked over only two penalties in the second half. 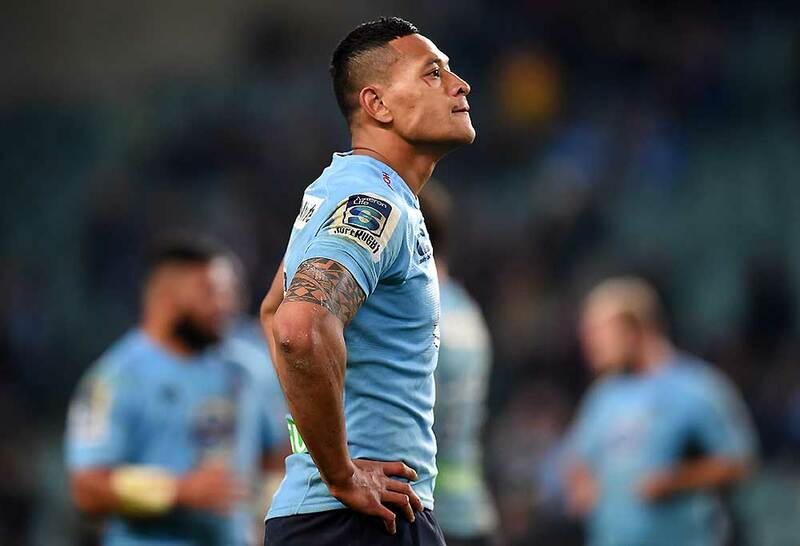 The Waratahs (who had been in South Africa for over a week), scored a second try, once again by Israel Folau when the game was lost. The final scoreline was a 37–14 drubbing. The most disappointing feature of the game from an Australian perspective was that the best young player on the field, coming on early as a substitute for Patrick Lambie, was a baby-faced rugby assassin, Curwin Bosch. This youngster looks like the real deal. He has had a brilliant schoolboys career and took to the new challenge of Super Rugby with an aplomb, style, skill, pace and kicking ability that reminded me (and this is the highest praise I can give) of a young, slender Dan Carter. Michael Cheika has identified the centres from the Force, the former NRL star Curtis Rona and Bill Meakes, along with the young Rebels flier Jack Maddocks, as the best emerging players he spotted in the first two rounds. But take it from me, none of these three has the potential of the Sharks youngster, Curwin Bosch. Now, back to the format of a future Super Rugby tournament. 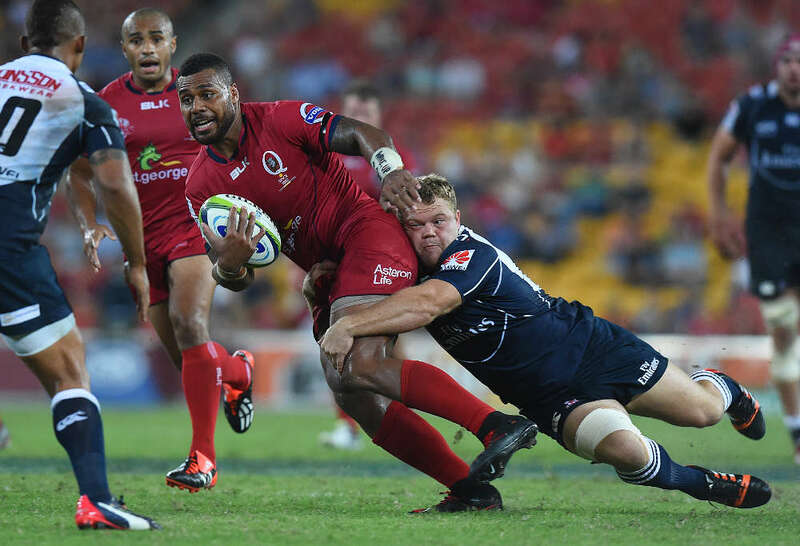 The story headed, ‘Axe looms over Australian and South African Super Rugby teams as New Zealand Rugby demands competition cut’ was written by Tom Decent and Georgina Robinson and looks to be sourced from within the ARU. It claims the New Zealand Rugby Union wants a 15-team competition, with five teams from New Zealand, four from Australia, four from South Africa, together with the Sunwolves and the Jaguares (presumably) making up the 15 teams. The story had these confusing (to me, at least) paragraphs: “If the New Zealand Rugby Union did in fact flex its muscle, and given all the unions have to agree on the make-up of the competition, the ARU may have been left with no other options but to get rid of one of its teams. No mention here of the New Zealand Rugby Union option of a 15-team tournament. Officials are also reluctant to unscramble a mess they have created. They almost always try to tart it up with small changes to make it seem more palatable. My guess from all of this, therefore, is that the 18-team, three-conference system will be approved for 2018 and up to the 2020 re-negotiations. This concept is tarted up for the ARU by enabling it to keep its five teams and for the SARU keeping its six teams. And the New Zealand Rugby Union? It gets a reduced amount of travelling and more local games, and, I am fearlessly predicting, a finals system that gives a ranked place to the top eight teams rather than the present system whereby the top conference teams get an automatic home final, whether they are a leading team or not. It still rankles in New Zealand that the Highlanders had to play a final against the Brumbies in Canberra last year, even though they were ahead of them on the tournament ladder 52 points to 43.